Riding a wave of anti-establishment sentiment, Jimmy Morales -- a comedian with no political experience and backed by military hard-liners -- has been elected Guatemala's next president. Many supporters of Molina’s ouster had supported Torres over the military-backed Morales -- albeit reluctantly, since she’d faced past corruption allegations herself. Morales, like his opponent, promised efforts to promote transparency and root out corruption. But he’s drawn criticism for his vague policies, his comedy act’s reliance on racist, sexist, and homophobic tropes, and the fact that some of his backers -- including the founders of his political party, the National Convergence Front (FCN) -- are conservative members of the military linked to war crimes from the country’s three-decade civil conflict. Though some Guatemalans are cautiously optimistic about the future, many remain skeptical that Morales will be able to pull the country out of its current political turmoil. “Nothing is going to change,” one voter said via Twitter -- even as she cast her ballot. Though it was corruption that ultimately felled Pérez Molina, the uprising against him took place amid a broader crackdown on human rights defenders of all stripes -- including human rights lawyers, journalists, labor activists, and indigenous groups resisting large-scale development projects. In Washington, members of Guatemala's Human Rights Convergence and other civil society organizations recently participated in hearings at the Inter-American Commission on Human Rights and met with U.S. government officials to discuss these challenges. In back-to-back hearings, petitioners highlighted the defamation and harassment of lawyers and expert witnesses in the ongoing genocide case against former Guatemalan leader Efrain R'os Montt. Pérez Molina, a former military commander who vociferously denied that any genocide had taken place, was himself implicated in atrocities against indigenous Guatemalans in testimony that emerged during the trial. Just weeks later, Alex Reynoso -- an environmental activist who’s organized against a Tahoe Resources silver mine in southern Guatemala -- survived a second assassination attempt. An earlier attempt last year claimed the life of his daughter, Topacio Reyes. 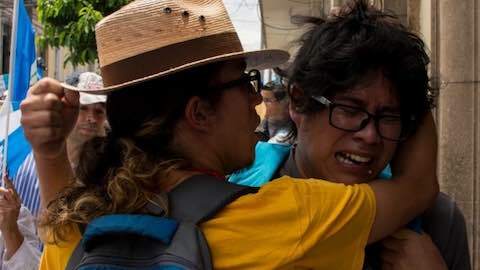 Many human rights organizations view these attacks as part of an ongoing pattern of repression against land rights defenders, as well as a test for the transitional government -- one the administration has failed. They accuse the government of dispatching security forces to protect transnational corporations -- and suppress any resistance to corporate misconduct -- while failing to properly respond to attacks against community leaders. Civil society has been armed with new allies, added Pascual, and the country's “social awakening” has given rise to a more informed and vigilant citizenry. With more people calling for justice, it will be ever more challenging for public officials not to act on behalf of the people. Still, the vast majority of these urgent concerns -- the ongoing militarization of public security, high rates of impunity, deep-rooted corruption, and increased violence against environmental activists, among a collapsing health care system and other issues -- are issues President-elect Morales has barely mentioned. To date, he’s shared no plan or inclination to address them. Latin America: "Military-Backed Comedian Will Be Guatemala's Next President"